According to reports out of Tampa, Howard suffered what's believed to be a minor injury in practice. The Red Wings just can’t seem to avoid the injury bug. On Wednesday, it was goaltender Jimmy Howard’s turn to get bit and center Stephen Weiss’ turn to get bit again. Finally, Steve Yzerman will get the proper Detroit sendoff while wearing a Red Wings sweater. According to reports out of Tampa, Howard suffered what’s believed to be a minor injury in practice. So the Wings recalled goaltender Petr Mrazek from the Grand Rapids Griffins (AHL) and are putting captain Henrik Zetterberg on long-term injured reserve. Zetterberg, who has already missed four games because of a herniated disc, will have to miss at least 10 games and 24 days. He would be eligible to return for the Dec. 28 game at Florida. Mrazek, 21, has a nine-game winning streak in the AHL, with a 1.56 goals-against average and 0.946 save percentage during that time. Overall, Mrazek is 10-2-1, tied for third with a 2.09 goals-against average and tied for fourth with a 0.927 save percentage. Mrazek will back up Jonas Gustavsson Thursday in Tampa. Weiss, who has battled a groin injury this season, had the injury flare up again and will not play in Tampa. According to Ansar Khan of Mlive.com, Weiss will undergo more tests when the team gets back to Detroit. "It was good for a little bit after (the last time); a little bit sore, but nothing crazy, then it went south here pretty quickly," Weiss told Mlive.com. "I’m concerned. Anytime you’re not in practice and able to skate, it’s not a good feeling. So I’m just going to see what the tests say." The Wings are also missing center Darren Helm, who has a shoulder injury. Pavel Datsyuk just returned after missing seven games with a concussion. 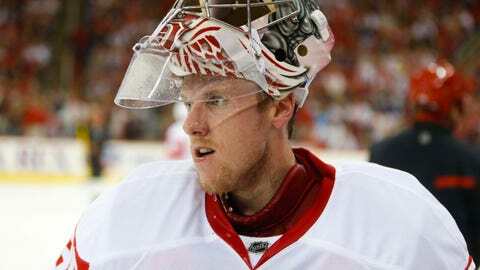 But the Wings are still down two centers, so Johan Franzen will play center against the Lightning.